This is a fun book, a foray in the political realm: a necessarily contentious region which is not over-leavened with real humor. Indeed, if economics is "the dismal science", too often it seems that political discourse is an aggravated assault upon reasonable minds. But the alleged dismalness of economics, properly understood, lies in the clarity of its conclusions, especially when those conclusions are inexorably contrary to our wish-fulfillment. Politics, of course, is the art or science of governing: that is, how we manage our society. A civil society, such as our modern Western societies aspire to remain, requires among other virtues an atmosphere of civility — an attitude worth keeping to the fore. If civility is almost essential to maintaining the freedoms of a civil society, following in armed support is the virtue of humor — not only a lightener of mood, but a great optical cleanser aiding our perspective upon this strange world in which we find ourselves. 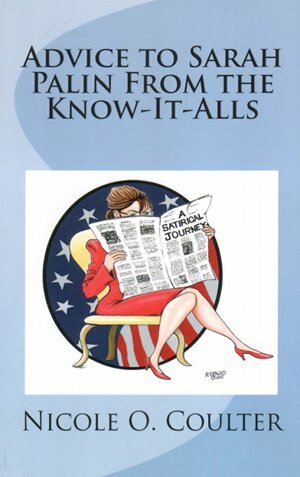 In this light, we have Advice to Sarah Palin From the Know-It-Alls: A Satirical Journey by Nicole O. Coulter. The book's format purports to be a series of advice columns, written by an elite Know-It-All pundit to Governor Sarah Palin and her supporters. Coulter avows that a key model for her inspiration is C. S. Lewis' The Screwtape Letters, advice letters from a senior devil to a junior one, sharing efficient methods for the diabolical seduction and moral corruption of souls. Coulter's advisor here sometimes resembles a single-minded group, the royal "we" of insider knowledge and political sophistication. Similarly, instead of a single recipient of private letters we have the general audience for published columns. Some of these advice columns appeared originally at Conservatives for Palin, a website whose readers are much more than averagely informed about Sarah Palin. Certainly some of the "advice", and hence some of the humor, depends on how much the reader already knows about Palin, and especially how closely the reader is aware of the propaganda war against her. But not much background is needed to enjoy Advice to Sarah Palin From the Know-It-Alls: if we bring a general knowledge of the American political scene, and a portion of the gift of laughter, the satire is easy to appreciate. As the anti-Palin propaganda campaign has not died away after the 2008 election, but continued and escalated into new heights of invective and depths of vitriol, observers who are striving to be objective may have wondered just what is going on — and why such desperate bitterness, and such blatant fabrications? Perhaps the politically-correct insiders who dispense their advice to the masses, the Know-It-Alls as Coulter dubs them, worriedly sense that for all their escalation, they are losing ground. Losing ground to what, we may ask. What is the target of propaganda, what is its contrary? The simplest answer is that the target and contrary is truth. The dissemination of truth should require neither insults nor falsehoods. What then is the purpose of satire? Well, to entertain of course, and in the process subtly to tweak our too-often lazy thinking processes, our naive acceptance of what the Know-It-Alls dispense as though it were truth. Perhaps the definitive function of satire is not to give us fresh information — although that may happen by the way — as to sharpen and focus our awareness. This surely is helped by a leavening of humor. What we did on that fateful August morning not so long ago is no secret, and nothing short of heroic. We in the elite media and know-it-all precincts everywhere sprung to greet the Palin challenge — head-on. Caught off guard initially, we quickly mobilized to assist newcomer Sarah Palin in her once-in-a-lifetime career opportunity. While welcoming an accomplished role model to the national stage, we did what any misogynistic, borderline psychotic group of people would do in our places: we gave her helpful advice on her fashion budget, counseled her on the real qualifications for vice presidents, and extended friendly tips about balancing her overwhelming maternal demands. And that was just the PG-13 stuff! Yes, Sarah Palin, with only eight years executive experience in government — eight more than anyone else on either ticket — needed our help, and badly. What you have to understand is we're not mocking, we're observing and reporting. And what we observe scares the crap out of us. We see someone we've never seen in politics before — a fearless outspoken Christian charismatic attractive conservative female governor who shoots moose and is raising five children. Are you kidding us? Sarah Palin is completely out of place, and she's giving other completely unqualified "Tea Party" individuals crazy ideas about running for office, too. Some have described the Sarah-Palin-Tea-Party phenomenon as a monster horror flick for us, but more accurately, it's like seeing Jackie Robinson stepping up to home plate for the first time in 1947. It terrifies us. Yeah, we know-it-all elites talk a good game about inclusion, but our politically correct philosophy actually is a twisted modern counterpart to the sad days of racism and segregation. Seeing people as members of identity groups — some worthy — some less so — animates our worldview. We probably would have been right there trying to chase Robinson out of the league, too, so don't feel bad. It's just what we do. Chapter III, "Why We Mock Palin"
The serious undercurrent here is that of course such Marxist-compulsive classification and divisiveness has been and remains one of the greatest and most successful threats to freedom in the modern Western nations. There's a lot of fine material in Advice to Sarah Palin From the Know-It-Alls that I'll just hint at: the Republican elite's Stockholm Syndrome; the use of fish sticks in an economy; the GOP Spelling Bee; how racial politics comes around again, and why; and the parlor game "Are You Smarter Than Sarah Palin?" Do not miss the classically simple chapter, "What Sarah Palin Is Doing Right". No elite conclave of Know-It-Alls could possibly have summed this up in a fashion more clear, concise, objective, and even serene. It isn't likely that we would read too far along this sequence of advice without being clear that it is, in fact, satire. It is an evolutionary journey, and should you begin to lose your bearings among the Know-It-Alls' advice, go back quietly to the beginning and re-read and re-think and chuckle — we won't tell. Much of the book is fictional of course, including for instance the "fantasy responses" of certain real people. But much of it is real, and this makes its impact so much stronger, even when its humor must be met by our amazed head-shaking at the follies of political mankind. Coulter delineates at the end what has been real and what she has supplied. Nicole Coulter's good-humored and witty style in Advice to Sarah Palin From the Know-It-Alls is by turns advisory, accusatory, or deploring — while being disconcerting, informative, and funny. An enjoyable journey through the American political scene.